The diaphragm, located below the lungs, is the major muscle of respiration. It is a large, dome-shaped muscle that contracts rhythmically and continually, and most of the time, involuntarily. Upon inhalation, the diaphragm contracts and flattens and the chest cavity enlarges. This contraction creates a vacuum, which pulls air into the lungs. 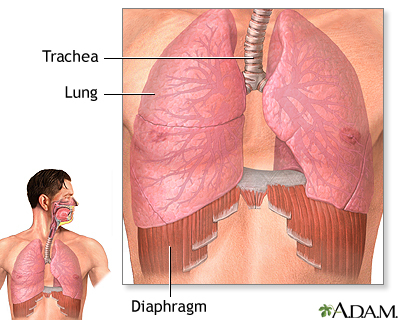 Upon exhalation, the diaphragm relaxes and returns to its domelike shape, and air is forced out of the lungs.